One in four ministers will be fired at some time during ministry. One of every three ministers is serving a congregation that forced the previous minister to pack his books, empty his desk and turn in his office keys. The average length of service for American ministers is between four and six years. These statistics have names, faces and families — yours, a friend's or a colleague's. Bill and Karen Colle, Don and Charmaine Cooley, and Randy and Rita Seale are among them. They gathered one afternoon at Park Avenue Baptist Church in Titusville, Fla., to talk about being forced from ministry. How were you forced from your position? Randy: In 1992, I served as senior minister at a traditional Baptist church in Arkansas for 13 months. The members were unaccustomed to change or new ideas — even as simple as donuts before Sunday school. A deacon was in an adulterous relationship, and another (female) leader had been involved with a former (male) minister. Two deacons were so angry they couldn't sit together in a meeting. When I heard about these situations, I told the leadership we needed to make things right, but they resisted. The pressure mounted with one conflict after another. At the end of my first year, I met with the men and asked them to either follow me or ask me to leave. I thought at least five or six men would stand with me and that we could start fresh. But not one (offered support) or said anything until after the meeting. So I came up with the idea (of resigning), and everyone "amened" it. Don: You've been reading my story! I attended my church in Jacksonville, Fla., for 22 years and had been a youth and associate minister for 10. My wife was our church housekeeper. When the senior minister retired after 32 years, another staff member (with whom I'd had conflict) hand-picked an old seminary friend to fill the position. Two weeks after he came, the new minister fired my wife because he wanted to surround himself with his own staff. At the end of the month, he fired me too, leaving us both unemployed. I was hurt, angry and scared. It would have been easy to return to my old job at the post office. I could forget God altogether, but I couldn't because my kids would, too. But I will tell you this: It never stops hurting. That's the bottom line. I loved ministry so much, but because of these two or three people .... It just doesn't stop hurting. What happened in your situation, Karen and Bill? Karen: In 1971, Bill was called to serve as music and youth minister at a Houston church — an affluent but apathetic congregation. Even the youth didn't seem to need Jesus; they had their Neiman Marcus credit cards. No one participated. If the members saw Bill, they'd run because they didn't want to be in the choir. Everything we touched failed. The leaders told Bill to look for someplace else to go. How did the termination affect you emotionally? Karen: I started a downhill spiral, hitting a deep clinical depression. I lay in bed, screaming at God, "I can't go any farther down. I can't go." I could see myself in this deep, hideous pit that I couldn't get out of. I couldn't see light. I tried to commit suicide. I knew that I could be with God and wouldn't have to live anymore. I had three young kids, but I didn't think about anyone but myself. Bill was a zombie during this time. He lost all of his personality and walked around in a daze. "That's not who I married," I complained to God. "I don't want to live with this guy." It was a horrible time. Bill: Karen was a hurler, but I withdrew. That's how I handled things. How did others interact with you after the termination? 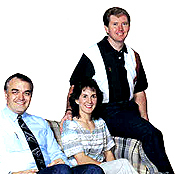 Karen: Bill was in church one morning for service, and that night we went up to his office, collected his stuff and left. No one said anything. We walked through it alone. Rita: We did, too. We had nobody. Karen: Even other ministers acted as if we had the plague. Don: Former church members see me and walk in the other direction. For example, I stood with an elderly woman (from the church) when her husband died, holding her husband's hand. Today, if that woman sees me in the grocery store, she turns away. Bill: She just doesn't know what to do. Remember, people avoid (those in crisis) because they don't know what to say. In Christian conferences we attend, we're being taught to say, "I'm sorry this happened to you." Karen: It's like, "Please acknowledge that I'm here and something went on in my life." Don: I never thought about it that way. It just seems as if others don't want anything to do with me. When did you know you would be okay? Rita: When a woman prayed for me, using Joel 2:25. It says the Lord would restore the years the locusts had eaten. But God called the locusts "my great army that I sent among you." God sent the army of locusts. When I read that verse, I had to deal with God. Once I realized that, I asked him, "Okay, what is my part?" He told me to build relationships and make friends, because I had withdrawn into my world with my kids. That was probably the hardest part. Bill: I got peace during a local revival, which I worked at with an evangelist to earn extra money. After one noon revival meeting, I poured out my heart to this evangelist — the first time I had told anybody anything. The worse I sounded, the more he said, "Praise God! Praise God!" He explained, "All you've got to do is die to this whole thing. That's what God's doin' — he's killin' you." Killing me? Mr. Everything? But God was interested in my brokenness. Karen: I've always blamed God for things, never man. I knew it all went back to him, so one night, I went screaming, fists shaking, to him. "I have given my life to be in full-time Christian service. How dare you treat me this way?" I told him to never speak to me again and went to bed. The next morning, I remembered I wasn't speaking to God and worked hard to keep it up. But later that day, God spoke to me: "Karen, you have trusted me with your death. Why don't you trust me with your life?' Yes, I did trust him with my death, even to the point of attempted suicide. So I said, "Okay, see what you can do." From that moment on, I was changed. What advice would you give those who are facing termination or have been forced to leave their church? Rita: Remember that this is just a season in your life. It will pass, but hang on to each other. Bill: It took months to heal. Some things are done quickly, but other things are not. Realize family members go through this differently. Give your mate permission to feel the way she feels and express herself. Don't expect her to go through it and be healed in the same way or length of time. The same is true for your children. Karen: Be honest with God. Tell him exactly how you feel, no matter how ugly, mean or hateful it is. He knows anyway, and he's big enough to handle it. Randy: On the cross, Jesus said, "Father, forgive them, for they do not know what they are doing." They crucified him on purpose, but it was God's ultimate will that Jesus be there. Jesus understood that. We can release people from what they do to us because we understand that at the bottom is God. I know that God will show me what he wants me to learn. One week, as I was mowing yards, God said to me, "You'll be healed when you forgive." He did something supernatural. As I forgave, I was healed. Rita: Take the risk again with God. Push yourself out again, because if you close yourself off from people, you've lost your usefulness. Don: God ministered to me through music. I love the chorus that says, "In his time, in his time, he makes all things beautiful in his time." Isn't that neat? Not so much my timing, but his. Article copyright © 1997, Melody Schilling. 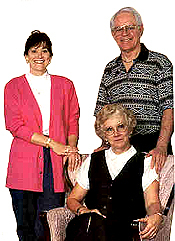 Author Melody Schilling lives in Titusville, Fla.
Don Cooley began serving as senior minister at Hart Haven Baptist Church in Jacksonville, Fla., in December 1995 — two months after being terminated from his previous church. His wife, Charmaine, is a teacher's assistant at an elementary school and couldn't take time off on the day of the discussion. They have three children. New Covenant Baptist Fellowship in Titusville. Randy and Rita have four sons.